Work is under way to minimise the impact of Brexit on the construction sector in Ireland, according to the chairperson of the Oireachtas Housing Committee. 50% of plumbing materials and 30% of wood products used in Irish building projects come from the UK, according to Fine Gael TD Maria Bailey. The issue is one of a number raised in relation to housing and construction in a report from the Dail's Housing Committee. 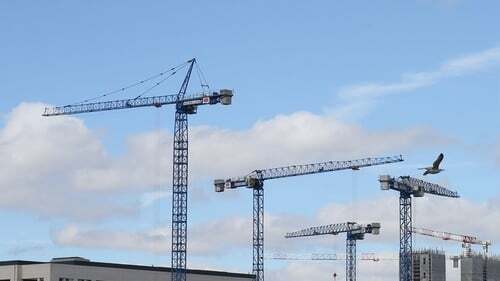 Speaking to RTÉ News, Ms Bailey said each EU member state has a notifying body to certify certain standards for building and construction equipment. However following Brexit, products made in the UK would need to be certified to these European Union standards. Ms Bailey said Government departments are working with companies relocating from the UK to Ireland to certify their products under Irish domain, as well as working with other UK companies to ensure their products would still comply. "There is ongoing work currently happening in that field to offset delays or additional charges," she said. She said this process merely looks at ensuring the products reached the required standard, other issues such as minimise transport delays are covered within the Withdrawal Agreement. The Dún Laoghaire TD also said that Ireland is on target to deliver 25,000 homes in 2021. However, concerns over whether the housing department's Rebuilding Ireland policy can remain as the current blueprint for tackling the housing and homelessness crisis have also been raised in a report. The report was also critical of a number of Irish Government polices after it examined possible social and economic changes that could arise as a result of Brexit, and the potential effects they could have on the housing market. However, it stated that many of the issues the housing sector could face post-Brexit are existing issues that would be worsened, rather than specific Brexit-induced problems. The authors of the report have urged housing minister Eoghan Murphy to "Brexit-proof" the department's current housing polices. "With Ireland currently experiencing a substantial housing shortage it is necessary to examine if Brexit could impact the housing market", committee chairwoman Maria Bailey said.